From skip hire for building projects to large clearances, you can count on the experienced team at Britannia Skips Ltd to provide you with a commercial skip hire service that caters to your specific needs. If you are in need of a suitable commercial skip rental in East London, Britannia skips are the perfect choice for you. Not only do we provide you with Cheap Skip Hire, East London, making it easier for you to concentrate your resources on other important aspects of your commercial businesses and projects, but we provide an efficient same day delivery service. When you’re finished and it’s time for us to pick up the commercial skip hire, we are equally quick to respond to your call. We also can be called upon to arrange any permits needed for Commercial Skip Hire in the East London areas. The beauty of this service is that you don’t have to concern yourself with unnecessary forward planning of when you might expect to need a commercial skip rental, or to try and plan when it might be full enough for collection. 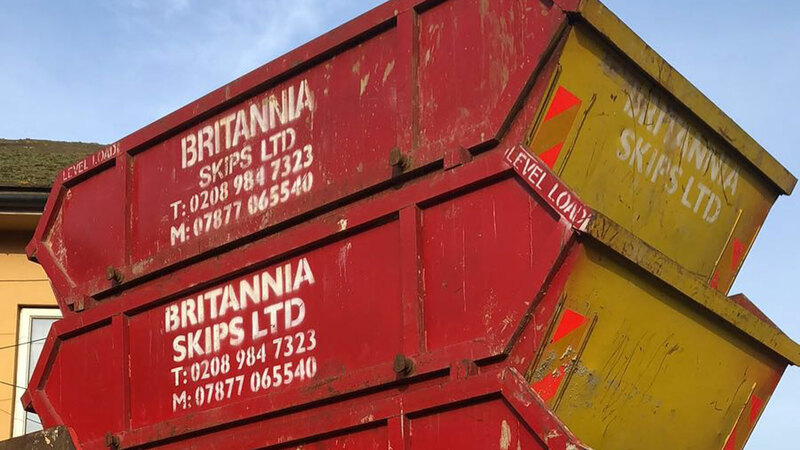 Britannia Skips Ltd understand the importance of suitable reliable waste management services when you are under-taking new projects that might require a temporary skip hire service, and when you need a regular contracted delivery and pick up of all your commercial skip hire needs. This kind of service supports the overall continuity and running of any successful business and commercial enterprise. East London is home to a huge array of commercial businesses, all competing in order to be successful. As a successfully run business, Britannia recognise that the last thing you need is to be concerned with secondary aspects of your businesses running services. Therefore, we provide a free quote, making it easier to plan and organise which waste management system you wish to use. We can provide you with suggestions, based on the review of our quote, on which size skip may best suit your needs. Feel free to contact us today for advice and to arrange a quote for your commercial business. Our expert team of drivers can also make it possible to deliver your commercial skip hire in your desired location, so that it causes the least disruption to your clients and associates accessing your services.